Teacher-consultants who have developed a reputation among their colleagues as knowledgeable resources and as supportive to their fellow teachers are selected to become group leaders (of either a study group or a writing studio) at their own schools. In the spirit of collegiality and professionalism, they invite novice and veteran teachers to join them at monthly sessions to explore issues of interest. Both types of group are grounded in inquiry. Study groups see themselves as professional discursive communities that use a variety of strategies to solve problems. Professional texts are often used to begin substantive conversations and to surface issues for further inquiry. 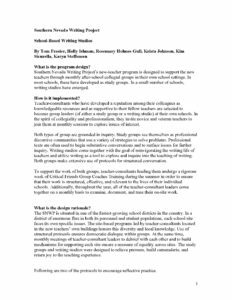 Writing studios come together with the goal of reinvigorating the writing life of teachers and utilize writing as a tool to explore and inquire into the teaching of writing. Both groups make extensive use of protocols for structured conversation. To support the work of both groups, teacher-consultants leading them undergo a rigorous week of Critical Friends Group Coaches Training during the summer in order to ensure that their work is structured, effective, and relevant to the lives of their individual schools. Additionally, throughout the year, all of the teacher-consultant leaders come together on a monthly basis to examine, document, and tune their on-site work.